I had a very quick, but wonderful trip to Provence with mon chéri a few days ago. He spoiled me with lovely dinners and a lot of patience when I did some sketches. I tried to be as quick as I can with pencil and left the ink lines until the very end so I could change to some neater linework where necessary. In some sketches I went in directly with watercolor and added the pen line work afterwards..maybe you’ll be able to notice that? all sketches done in watercolor block, HP, 18X26cm. This sketch took me the longest. It was the first one of our trip and I was still very careful in getting it “right”. And mon chéri was ever so patient. I then decided, I can’t spend all of our very short trip on such long sketching..so then I sped up in the sketching, trying to get down just a little ambiance of the trip. I am a “corner” person. I love little corners or scenes, or little vignettes. So it is usually a little interesting corner of a larger scene that attracts my eye. The lavender fields are stunning, stunning, stunning and there is no way I can do justice to them..of course had to attempt a field against a backdrop of this lovely mas. There are so many paintings everywhere to be found in Provence, depicting the lavender fields and the olive groves..sadly, I found them all the same, interpreted in the same manner. It makes me even more reluctant to try and paint it. But of course..like all the other painters, I will paint it! I am also fascinated by staircases and uneven walls, foliage growing out of nowhere, of which there is an abundance in the south. A corner of the facade of Le mas de la Mateliére where we stayed. The rooftops, the streetlamps, the worn walls, the trees blown by the mistral…the charm of La Provence. 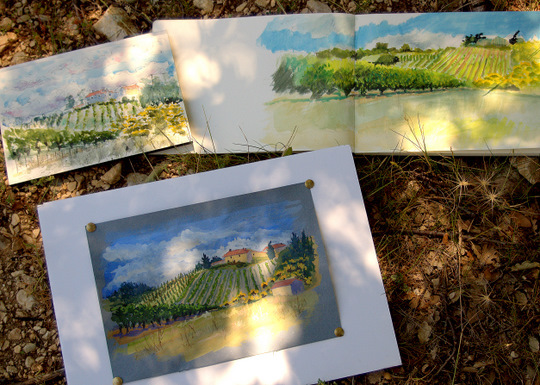 I cross posted this post also on our blog, Four go painting in Provence, from 2 years ago, where Katherine and Robyn, Sarah and I went on our painting trip to the Vaucluse in Provence. Maybe you’d like to browse it again to see the paintings of our trip in 2011. 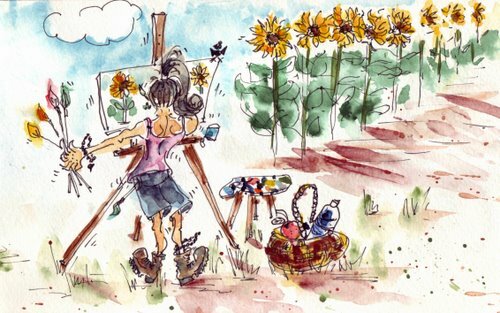 I so wanted to meet up with a friend who took 8 other artist on a painting trip to Provence, but time didn’t allow for it. 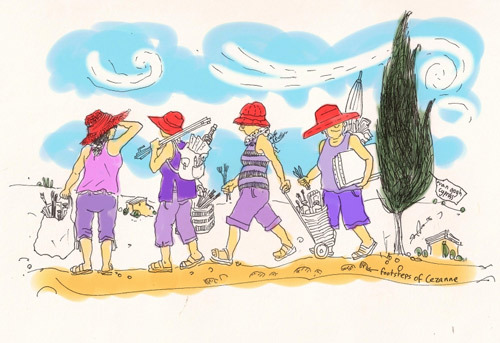 You can see their adventure here Sketchers in Provence. It seems I always nobly get to Provence on these ‘quick’ trips. But I have decided this is it. No more “quick” trips when it comes to Provence. My next trip will be nothing shorter than 8 days. I will also plan better in terms of subject matter so as not to be all over the place. 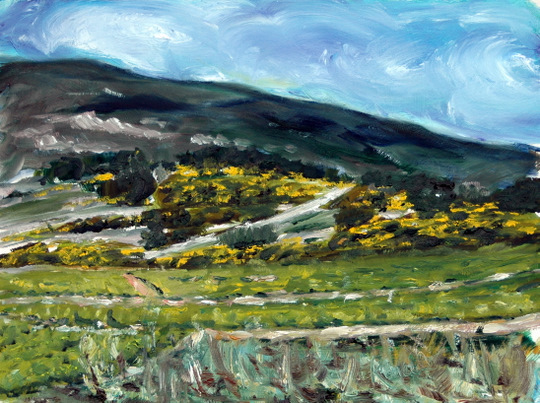 Provence is filled with huge painting opportunities and so, my goal is to spend my time making full use of the opportunities. Two oil paintings and a gouache. 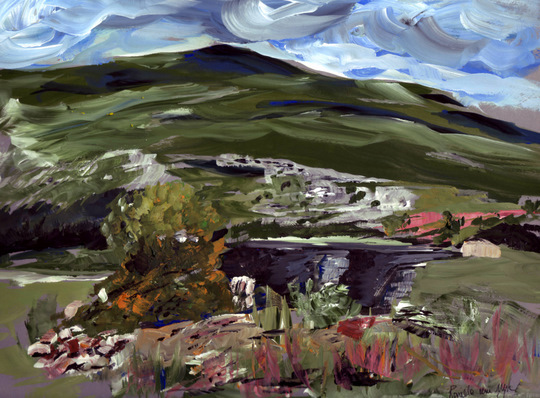 My last post on Painting in Provence. Two oils and one gouache.All three were halfway done in the field and completed afterwards. they were all done at about three in the afternoon on hot days with the cigales singing in my ears, which was typical and I have no complaints about that. But the ants are at their most active at three in the afternoon too! Or so it felt! I got bitten the second I dare stand still and at some point I started feeling like I was knee deep in the movie “The Mummy”! And some images from my four days…for more photos, see “Provence” under Beauty of la France at Myfrenchkitchen. Our first outing was to this lovely spot and we planned on all doing gouache. Except for me – I had a real bad hair day and nothing worked that day…Robyn gave me such encouragement and comfort that day…she’s very special. The gouache you see here, was done here in Correze from the little watercolor I did on the spot. 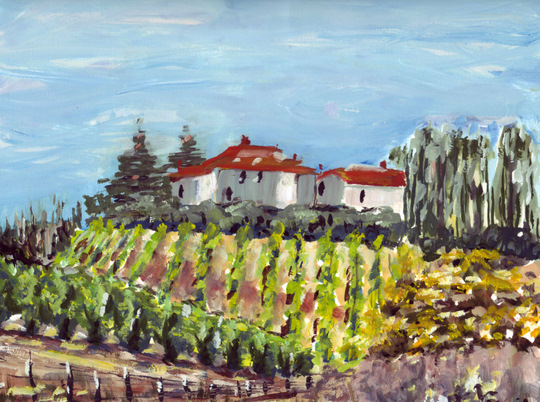 It isn’t quite what would normally make me jump in the air from joy, but seeing that it came from an already hesitant little watercolor, I think I will now yield and validate it as OK.
…the original watercolor sketch, vineyards and cherry orchard..
Sarah’s painting of the same spot a few days later is on her post Farm and cherry orchard afternoon. This was very early…6:30 in the morning. Sunrise. But it actually works more as a sunset painting! 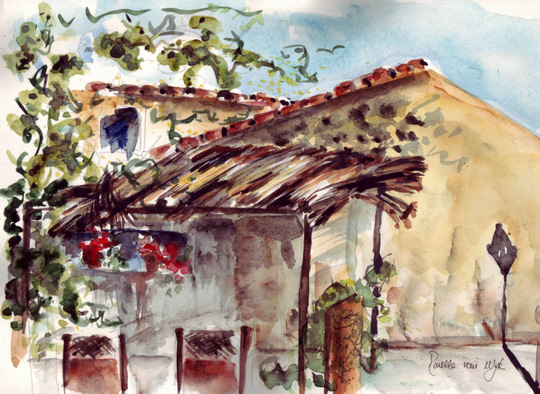 And to finish off…a sketch of a terrace in the little village Bédoin, while having a diabolo cassis at the café opposite. To follow: Oil and gouache studies. 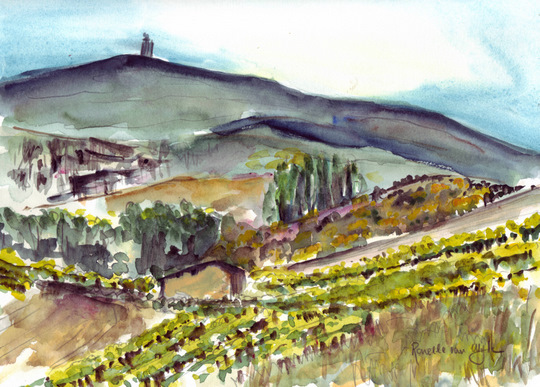 Africantapestry is off to Provence for a crazy painting experience! 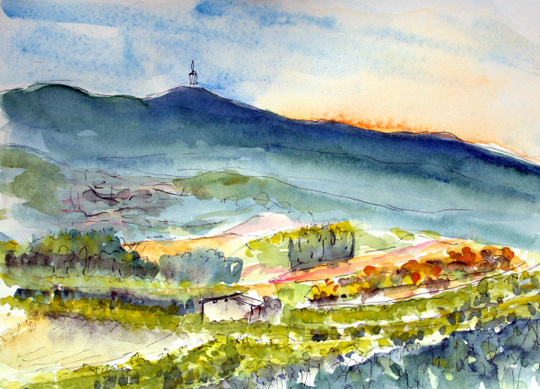 Yes, I’m off to Provence this coming weekend for a crazy painting time with 3 friends for one of three weeks in total. Katherine needs no introduction,; if you don’t know about the role she plays in the virtual art world, then shame on you…go and read about her!! And who doesn’t know Robyn and her biggest fan Dermott(or is he??)…? And about Sarah, well I don’t have to say another word, because a professional painter of her standard doesn’t need any introduction! So there you are, four nutty women off to Provence to paint….mostly paint…and then also feast on Provencal foods…and wines….drive around….get lost….dance to wild music…chat, chat, and chat….laugh, laugh and laugh(we all four have an overly developed sense 0f humor)…swim….cycle… and eveything else one does in Provence? We’ll be staying in the Vaucluse home of well known painter of Postcards from Provence, Julian Merrow Smith and his wife Ruth Philips, while they will be in England where Ruth will be playing cello at the Garsington festival. Seriously though, we’re planning on doing a lot of painting…all of us will be doing aquarelle, some gouache, some will do oils(I’m one and I know for sure Sarah is another) and then there will be coloured pencils, charcoal, inks and pens. 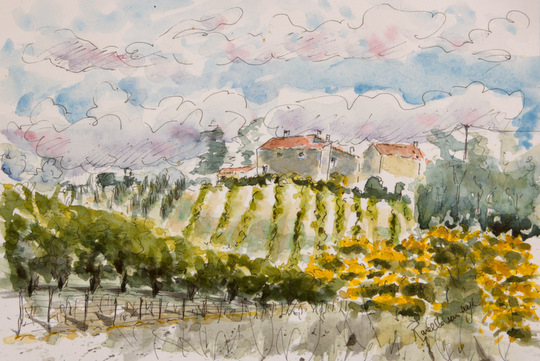 We will of course leave Provence with cases full of sketches, a lot of plein air paintings and drawings well do in the evenings after the dishes. 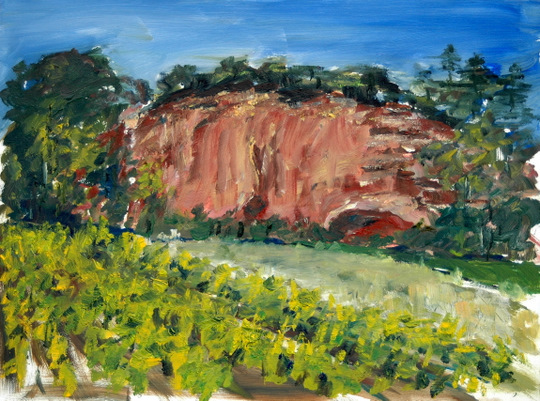 We will also post regularly on Four go painting in Provence to pin down our daily experiences. So please drop by and please join us and who knows, our fun might lead to you doing the same in Provence next year. I think we might be in Prague next year…or Sicilia…or Marocco…anyhow, we’ll be somewhere! But for now…move over Cezanne, here come the four mad hatters!